Labor Day has come and gone along with the kids back to school. Time to head out of the city and do a little fishing. Let's find a destination that isn't too far, 4 hour drive, nice accomodations, three meals a day and great fishing! Oasis Springs fits is all of the above and more. It is five miles down a dirt road so the water is private. The lodge wasn't full at this time so there isn't a lot of competition for the home waters. We are talking about trophy trout water across the lawn from the lodge! Beautiful, wild trout in excess of 5# were caught on small nymphs. Fish rising to hoppers in front of the barrier before the dam. 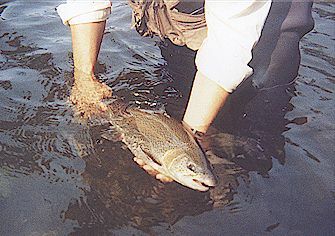 The greatest problem was being able to land such large, feisty trout. the net just wasn't big enough. There was as much fun for those watching anglers as well as the person with the next fish on! Great trip!! Possible location for a fishout next year! Hope this peaks your interest.